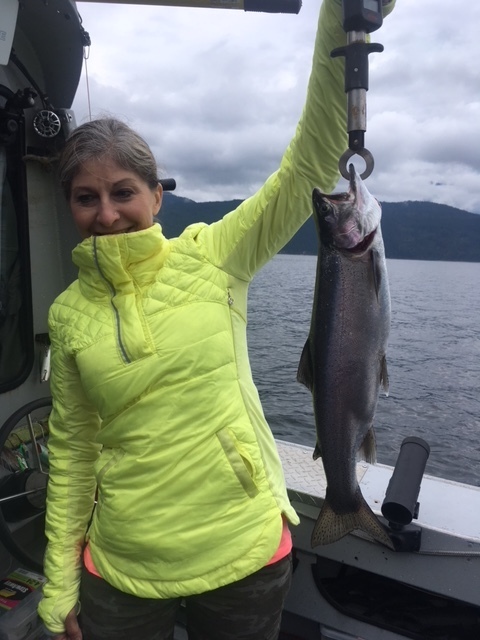 First off, I’ve got to share this great video from one of our days on the westcoast. These guys put together a short film of their experience. And since we are already booking our trips for next year, I thought I would share this . Check it out. Fall is in the air. The water has cooled. And it’s now time for my favourite season of fishing. 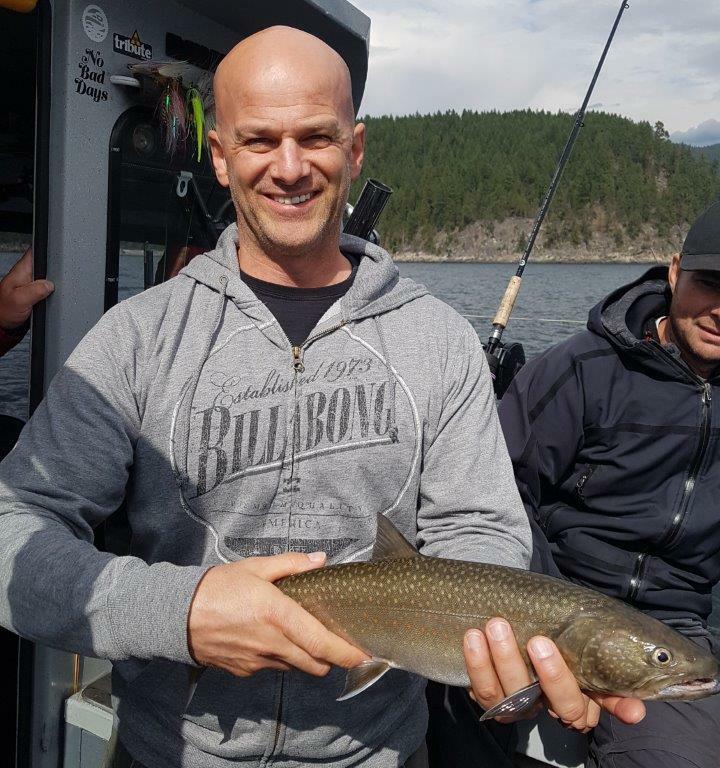 The fishing has been consistent on Kootenay for the past month and should only get better as the water cools down. Most days we’ve had around 10 fish to the boat and a few days even busier. 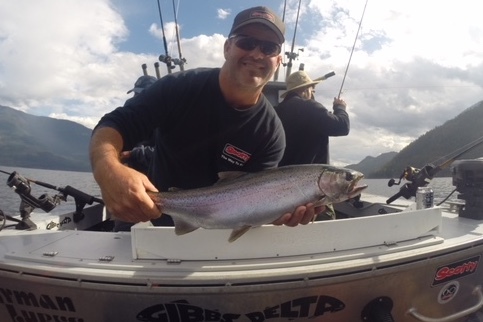 Rainbows have been fattening up a bit this fall and there’s been a few in the 5 pound range. Lots of 2 -3 pound fish with the odd bigger one mixed in. And Bull Trout are still hanging in there as well. We are seeing a few Bulls up to 10 Lbs, but mostly 3 – 5 pounders. Looking forward to what the rest of October will bring us. Stay tuned, as there are a couple derbies coming up as well. These are usually the indicator of what the fall/winter will bring. The annual Thanksgiving derby is this weekend Oct 6,7,8 out of Woodbury. And then the following weekend is the Nelson City Police Alumni charity derby. We will be present at the NCP derby as it is a great fundraiser for the Kokanee Creek interpretive centre. Hope to see you there Oct 13 & 14. Come on out and support a great cause. The weather has been a bit ugly the past couple weeks, but we are still managing to get out a bit on the river. Fly fishing for Rainbows has been productive, and spin casting for Rainbows and Walleye has produced as well. 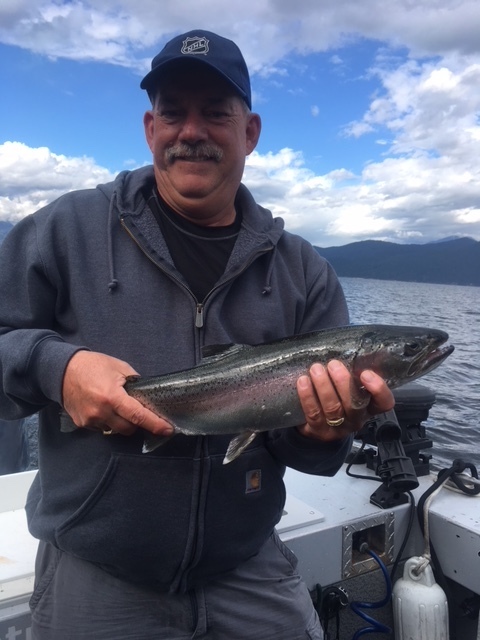 The usual 2 -3 pound Rainbows are coming in, with a few up to 5 Lbs. And the Walleye seem a bit smaller than last year, but still some great eating fish at 2 – 3 Lbs. Hoping for some decent weather to prolong our river fishing. Stay tuned…………..
On the lake it’s been the usual assortment. Bucktail flies have been working, as well as small spoons and hockey sticks. Our best lures have been flies in the # 210, 215, & 226 colors. And crocodile spoons in the brass/fire wing, nickel/fire stripe, and brass/fire stripe colors have been working just as well and sometimes better. And for the Bull Trout, we’ve been catching mostly on the flasher/hoochie combo. Green Lemon Lime flasher or STS flasher with a green spatter back hoochie has been my stand by. The Bulls have been between 80 & 120ft lately. And our rainbows have been caught on a mix of croc spoons on the spinning rods, or streamers and nymphs on the fly rods. Stay tuned for more reports. If there’s something you’d like to know, drop us a line. Or, just let us know what you think. After all, it’s our clients that make our business. So, give us your feedback ! !